Enter your telephone number and get a discount! Get a tour to Vietnam! Ashtanga Vinyasa Yoga is the most dynamic yoga. Its main aim is to train stamina, strength and flexibility. During practice excess fat actively combusts, stretching back surface of the body, the disclosure of the hip joints and purification of the body generally. 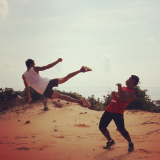 Thai boxing is not waiting for strong and hardy fighter - it trains them. It causes a storm of positive emotions, thus reducing stress, improving stamina, reaction speed and health state genearlly. A set of exercises aimed to restore muscles of the face and neck. The main advantage is non-surgical and non-invasive method of preserving and extending the youth and beauty of the face. I am glad to choose your company, glamorous team of trainers, they helped me to loose my weight in 2 weeks! I was 81 kilos before my arrive, and now i am 73 kilos! Nice hotel, a lot of sport programs, prfoessional trainers and a lot of fun. Wonderful tour, recommend for all! I was planning to rest in Vietnam, but i didnt want to skip my muay thai classes, and Slim People helped me with that - they have very good Muay Thai trainers at their camp. Losed 5 kilos in a week! Sport, healthy food, fresh air - great combination! I'll be back! This program suits for who want to lose some kilograms and rise self-appraisal. And become slim, tight, energetic, flexible, strong, cheerful, harmonic. - For those who want to create a conscious relationship to food and for all to give up bad eating habits. - For those who want to enjoy the warm sea and soft rays of the sun, walking on endless beaches and breathing the salty sea air. - For those who want to learn the history of Vietnam and visit amazing places in our region. 8:30 Breakfast in the restaurant "Veranda Beach Resort"
13: 00-14: 00 Lunch at the restaurant "Veranda Beach Resort"
19: 00-20: 00 Dinner at the restaurant "Veranda Beach Resort"
Massages are distributed among program participants throughout the day. All children in the program are allowed only with parents. You are solely responsible for your child. Cost of the tour for the child if staying in the room, without providing a separate bed is $ 400 for two weeks, which is an additional charge for meals (3 times a day plus two fruit pause). Extra bed is $ 250 a fortnight. You can also book a massage at the price of $ 20 per hour, and any exercise at a price of $ 15 per hour. Participation in excursions child free of charge. Until you do, our staff will look after your child, carry away its various games will monitor safety while in the pool and on-site parking. We advise you to take the program children are not younger than 2 years. The presence of children under 2 years of discussion on request. This program is suitable for those who want to be slim, fit, energetic, flexible, strong, hardy, vigorous and cheerful. Who wants to enjoy sports on the beach, improve your health and get a lot of positive emotions. Who wants to form habits of a healthy lifestyle and to understand that the sport - it's fun, exciting and not at all boring. - For those who want to discover Muay Thai and understand what Thai boxing - it's a great cardio and cardio to help train the heart muscle and improve blood circulation. Your muscles come in a tone that changes the quality of the body for the better. Thai boxing - this is not just a sport - it's a lifestyle. It causes a storm of positive emotions, thus reducing stress levels, improves endurance, reaction speed and overall health. - For those who want to enjoy the warm sea, warm sun, sea breeze and strengthen your immune system. - For those who want not just to buy a tour in Vietnam, spending their vacation lying on the beach, but do it for the benefit of the organism, as well as learn the culture of this country, and excursions to visit amazing places in our region. - For those who are ready to experience bliss, living on the territory of a luxury boutique hotel, located in the vast, deserted beach of the South China Sea. "Veranda Beach Resort" is located in the landscape design of the garden, walking through which you will feel how your body absorbs positive energy. At your disposal also 2 swimming pools, the rooms you'll find everything you need: TV, refrigerator, air conditioning, a fan, a kettle for tea and coffee, hairdryer, toiletries. On the first day of the program, our coach conducts fitness testing and is an individual training plan. 8: 30-9: 30 breakfast in the restaurant "Veranda Beach Resort"
14: 00-16: 00 Free time. You can relax on the beach or by the pool. The massage evenly throughout the day between the participants of the program. Every Sunday we organize the output, which you can spend relaxing at the hotel or go on a fascinating tour. The cost of travel for the child if staying in the room, without the provision of a separate bed is $ 400 for two weeks, which is an additional charge for meals (3 times a day plus two fruit pause). Extra bed is $ 250 a fortnight. You can also book a massage at the price of $ 20 per hour, and any exercise at a price of $ 15 per hour. Participation in excursions child free of charge. Until you do, our staff will look after your child, carry away its various games will monitor safety while in the pool and on-site parking. We advise you to take the program children are not younger than 2 years. The presence of children under 2 years of discussion on request. This program is suitable for those who want to enjoy their stay in Vietnam, living in the territory of a cozy boutique hotel "Veranda Beach Resort", located near Phan Thiet on a deserted, secluded beach surrounded by landscaped gardens, which grow in abundance of tropical trees whose fruit You can enjoy ..
- For those who want to enjoy the warm sea, the salty wind, spectacular sunrises and sunsets, warm and soft rays of the sun. - Who wants to hear about the culture and history of Vietnam, visit the tour and enjoy the amazing places in this region. - For those who want to learn an amazing technique to rejuvenate the face and realize that beauty can be saved without resorting to Botox injections and various detectives, do not injure yourself plastic surgery. - For those who do not want to engage in intense exercise, but I would gladly have joined the yoga and learned the beauty of Vietnamese massage. 8: 00-10: 00 Breakfast in the restaurant "Veranda Beach Resort"
13: 00-15: 00 Lunch at the restaurant "Veranda Beach Resort"
Every Sunday, no lessons, you can relax on your own site or visit a fascinating tour. This program is worth $ 1700 for 2 weeks. when more and more want to get warm and grayness outside leads to depression, it's time to cheer up yourself! The "Slender people" a great experience, and fill you with energy and positive! You can change the quality of your body and gain even more confidence in themselves and their abilities! Our training camp started its work on 15 October. You can call any day and at any time!